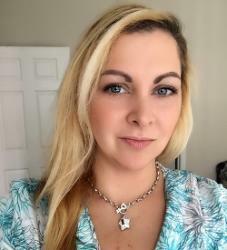 Summer is a party season. Whether it is a picnic at the beach or park or a backyard barbecue for the Fourth of July, summer parties definitely need refreshing fruit treats. One of the best ways to make fruits easy to tote and enjoy at a party of any kind is to create fruit skewers. It eliminates the needs for cups and utensils, making it much more likely that your guests will grab onto this sweet yet healthful treat. Fruit skewers should be fun and vibrant. 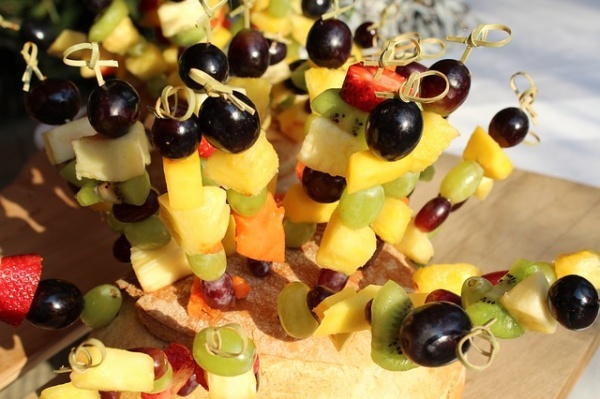 If you are looking for fun fruit skewer ideas for your next party, these ten ideas are sure to be a hit. When we think of summer, we think of watermelon. It can be messy carrying slices of it around the backyard. And then, you get trapped talking to your dad’s coworkers while you are trying to make your way to the trash to toss the rind. With these frozen watermelon skewers, all you need are those bamboo skewers, a watermelon, and a melon baller. Scoop the watermelon out into balls and spear the balls onto your skewers. Then freeze them. You can even do it overnight. When it is party time, you will have this fantastically fruity frozen offering. Do the kids run straight to the dessert table to ravage the cakes, cookies, and brownies? Well, now you can get them to eat a little fruit with it too. Take your skewers and spear them with fudgy brownies, marshmallows, and strawberries for a delightful dessert on a stick. Additionally, you can drizzle them with fudge or serve with a chocolate fountain if you are feeling extra indulgent. There is just something about berries. They are naturally sweet and totally delicious. Plus, they are filled with antioxidants and all kinds of good-for-you nutrients. Making skewers of berries also looks pretty too. You can arrange different patterns of blueberries, strawberries, and raspberries for a gorgeous skewered fruit snack that will disappear fast. A trip to the islands might be out of your budget, but serving tropical island fruits isn’t. You can make a splash at any party from a backyard barbecue to a luau-themed bash if you take slices of tropical fruit and skewer them up. Try pineapple, mango, banana, and papaya. You can also use cookie cutters to make them into fun shapes, like stars. Want more extras? Try serving them with Greek yogurt mixed with lime juice for a fun twist, or sprinkle them with toasted coconut shreds. They are almost too pretty to eat. To make them, you simply choose fruits from all the colors of the rainbow and arrange them on your skewers accordingly. Set out on a platter, they look spectacular. Start with strawberries, followed by cantaloupe, pineapple, a green grape, a blueberry, and a red grape. You can also use a segment of mandarin orange instead of cantaloupe, or a slice of honeydew melon instead of a green grape. Kiwi would work too. The idea is to create a rainbow of fruit on a stick, and who doesn’t want to taste the rainbow? To make a fruit skewer bouquet, it takes a bit more skill than the others and a bit more prep time. But the presentation is worth it. Your guests will definitely be impressed. Cut pineapple slices into the shape of butterflies and skewer them. On another skewer, cut watermelon into a flower shape and put a cantaloupe ball in the center. And for the others, simply cut the pineapple slices into flowers and use strawberries and other berries as the center of the flower. Soon, you will have a beautiful and edible bouquet to dress up any party table. Make something the kids will not be able to resist eating. Skewer green grapes and at the end, add a strawberry. Add eyes by looking for eyes in the cake decorating section of your supermarket. You can attach them with a dab of frosting. It is an easy way to make fruit fun for kids. Why leave the fruit off the barbecue during your next backyard party? Skewer fresh slices of peaches, pineapple, and whole strawberries. Drizzle them with olive oil and grill for about 10 minutes, turning them on occasion. Before serving, drizzle with raw organic honey. Melons are so vibrant in color. Plus they are juicy and everyone loves them. It is hard to say no to something that tastes so good, and thankfully, melons are filled with all the good nutrients your body needs so it is a win-win. Making fruit skewers with melons is easy. You will need a watermelon, cantaloupe, and honeydew melon. You can choose to use a melon baller and keep things simple, skewering the melon balls onto the skewers. Or you can slice your melons and use cookie cutters to cut out a variety of shapes. Whichever way you choose, these will go fast especially on a hot day. I will end with this slightly fancy twist on fruit skewers that aptly combines sweet and savory flavors. Perfect for baby or bridal showers, or even for a backyard wedding, these skewers combine ripe balls of cantaloupe with prosciutto-wrapped mozzarella balls for an amazing contrast of tastes. Simply skewer the cantaloupe ball, followed by a basil leaf, and then the prosciutto-wrapped ball of mozzarella. Repeat until the skewer is filled. You can also sprinkle them with fresh shreds of mint leaves for another layer of amazing flavor. Now that you have so many fruit skewer ideas, there is just one thing left to do… plan your next party. Which one of these will you choose for your next event?